I am in a Democratic Party convention or celebration of some type. I know this because I look down and see a name on my name tag that is not mine, but instead “Eve Porter” (a young Democrat I used to debate in high school). 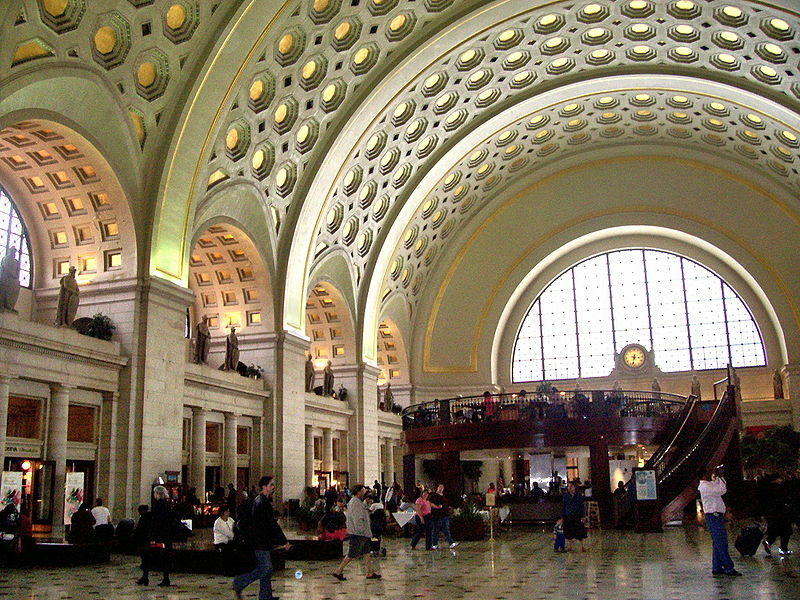 The convention is set in the grand hall of a train station in Washington D.C. (Union Station?). The scene shifts to the train platform. I see a brand-new shiny “silver bullet” style passenger train being unveiled at the platform. It was like a send-off celebration of this train. Everyone there got on board. I was in the front car. I marveled at this new train. It was modern, sleek, computer controlled, and had a sweeping windshield through which I could see panoramically out the front. But there were no human controls or any sign of an engineer. The only control was a large red button (like a panic button) mounted on a pedestal. I took this to be the emergency brakes of the train. I looked up and left and saw a digital readout (like you would see on a newer subway car). As the train got going, this readout read “60” mph in red LEDs. After the train departed the station, I had a sense of time passing. As I settled in and got busy with routine activities, I also had this distinct sense that everything economically appeared to be returning to normal, thus I could just relax and enjoy the ride. The markets were coming back. The economy was on the rise. Everything seemed well. Since I was in the first car, I could clearly see way down the tracks. We seemed to be in a dimly lit tunnel. There were several train tracks adjacent to ours to the left. I could see the headlights of an oncoming train. At first, I simply assumed it was on one of the adjacent tracks. But as I peered down the tracks, I wondered – is this train on the same track as we are? By the time I figured it was, I immediately hit the red button. But it was too late. The oncoming train didn’t slow much at all, and collided head-on into us at full speed. Catastrophic train wreck. I had this dream 2 days before the 2008 National elections. On November 4th, the Democratic Party swept the Presidency, Senate, and Congress by sizable margins. So the dream pretty clearly portended the immediate election results. What’s more important though, is the imagery of the silver train. I believe the “silver bullet” train represents a movement of the Nation into the policies and governance of the Democratic Party in the wake of the 2008 global financial crisis. Particularly, President Obama’s progressive vision (along with Senate Majority Leader Harry Reed and House Speaker Nancy Pelosi) of government and public policy being the answer to catalyzing and stewarding recovery. The fact that this train was new and shiny, represented a new direction for the Nation. “Silver Bullet” is a word play on the idiom of a singular solution to a major prevailing problem. The major prevailing problem being the economy and the global financial crisis. Notably in the dream, as time went on I felt reassured that everything was returning to “normal” economically and in the financial markets, pointing to the economic and financial implications of the dream. This too has been fulfilled in the – all be it weaker than hoped – recovery of 2009-2016. Certainly, the financial markets have returned to new highs. The “run away” aspect of the train (no controls), I believe has a two-fold interpretation. First, it represents the unfettered run from 2008-2010 which the Democratic Party used to implement their vision of governance for the United States. Legislation was passed, regulations were created, taxes were raised and money was spent without much political opposition or restraint. Second, because there has been little or no brakes on spending, the Federal debt doubled by the end of the Obama Administration. The ballooning Federal debt is a financial ticking time bomb and is widely viewed as unsustainable. With the selection of Donald Trump as the Republican nominee in 2016 came the newly coined phrase: “Trump Train”. At the same time, the Democrat’s progressive “silver bullet” train continued from President Obama to Democratic nominee Secretary Hillary Clinton. This then set up one of the most tumultuous general elections on record. No one saw the Trump Train coming. The Democrats were certain Hillary would win. But, the Trump Train, taking a page from the Democratic playbook got on the same political “track”, targeting lower and middle-class labor (a traditional Democratic stronghold). The forgotten man in the heartland of America (the “flyover states”), especially the rust belt became the deciding vote. The Trump Train won the election on the surprise victory in three crucial states: Wisconsin, Michigan, and Pennsylvania. All rust belt, traditional Democratic and labor union strongholds. The Trump Train crashed into and stopped the Democrat’s Progressive Liberal movement ushered in by President Barack Obama in the 2008 election. That movement didn’t see the Trump Train coming. The crash halted its progress. Now, a train wreck is not a good thing. There was a cost to stopping this progressive train, and the nation is left deeply divided with many angry people. 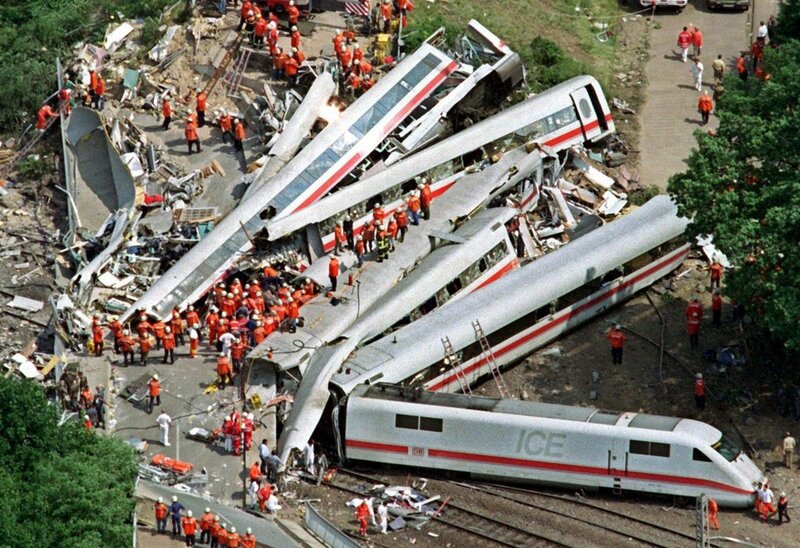 Many would describe the Trump administration as a train wreck. His campaign was populist, but his popularity numbers aren’t high. Stopping a political movement rooted in secular humanism was critical and really a form of ‘God’s grace shed on thee’. Protecting religious freedom and returning to our Christian heritage is also really important. Standing by Israel is maybe even best of all. However, doubling-down on the American formula of self-effort and supercharging a capitalistic system where the top priority is making money and winning can’t be the Christ centered answer either. What does the number “60” mean? I believe 60 biblically represents man (6) being weighed in the balance (10). Given that we the people of the United States have allowed God to be pushed away in one way or another, and instead have turned to man and man’s wisdom to solve the problems of our day, we must remember it is God who weighs us in the balance. In the original interpretation of this dream, I felt the economic aspect (passenger being lulled into false sense of comfort in economic and financial market recovery) was a warning of further economic trouble and not to be lulled into false sense of security. Why? We remain largely unrepentant. Of what? Our love of self for one, but our love for money is to the point of addiction. Most everyone in the US can only agree on one thing right now – we need more money : markets to go up, benefits to increase, taxes to go down, spending to increase, and the economy to expand even if it means expanding debt. Not only does this financial equation not add up, but more importantly : Who is god in all this? We (both parties and the American people) have become slaves to debt, scrambling to find ever increasing earnings to service our debt and spending habits. Further, no one would claim our financial markets and publicly traded companies are Christ-centered. No, they are unapologetically EPS and returns centered – pure money making machinery hiding behind a robo-veil of “shareholder’s interests” – as ‘god’ if you will. So whether we are willing to admit it or not, we continue to worship at a type of altar of Baal and remain on track for further financial judgment (2001, 2008 were the first two rounds) as the God’s way of course correction and repentance. Critically, the answer lies not in unbridled capitalism (worship of self and money), nor in government being provider (worship of self and money), nor blaming people who believe in these approaches, but rather in repenting for our wickedness and return to seek God’s face, trusting Him as our Provider. 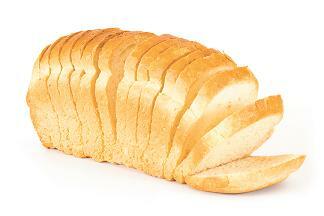 “Man does not live on bread alone, but on every word that proceeds from the mouth of God.” Matthew 4:4. I believe the terror of 9/11 was a harbinger of judgment and a call for the Nation to return to God. The financial crisis of 2008, the same. But, we as a people have not yet filled the bowls of repentance, nor have we changed our wicked ways (worship of self; idolatry of money). Let’s continue to pray for God’s mercy. Let us pray that God’s people – the Church – arise, and we as a Nation return to God’s great purposes and plan. Jesus remains our great and glorious hope. Let us return to Him as a people. “Return to Me, and I will return to you.” Zechariah 1:3. As the Pilgrims and our Founding Fathers honored Him, may we also do. Lord, may we once again be One Nation Under God.